Shoulder to Shoulder started over 23 years ago spreading the message of Inclusion, Diversity and Racial Harmony through the celebration of African Heritage in Nova Scotia. The band members bring their passion for these messages and music to every performance, using the power of music to educate others. Band members are made up of past and present AVRSB employees Lawrence Parker, Bobby Smith, Billy Lucas, and Fisher Akao, with additional member Mark Riley, who joined the band in 2008. The band has shared their message of harmony, inclusion, and social justice with many throughout Nova Scotia, with school performances within the AVRSB, Halifax Regional School Board, Tri-County Regional School Board, several local churches, Tim Horton’s Camp Day, and an annual African heritage month celebration at the Waterville Youth Facility for Young Offenders and also house band for the African youth Talent Show every year. They engage the audience through music, song and vocal harmony while sharing the important messages of social justice, inclusion, equity and addressing bullying. The band spreads their messages through musical fundraisers such as the Coldbrook Lou Gehrig’s ALS walk, and concerts reaching a wider audience throughout Nova Scotia. Many adults still remember the band’s performance from their school years and can relate to the stories that were told during those encounters. Shoulder to Shoulder were provided a wonderful opportunity to share their message of togetherness internationally when asked by the Canadian Red Cross Association to bring people together by song and vocal harmony who were rerouted to Camp Aldershot during the 911 tragedy. Shoulder to Shoulder is proud to continue making people smile and giving them a sense of happiness as they strive for their goal of racial harmony. Shoulder to Shoulder has recorded 2 albums under the label Ocean Sound Production, produced by Carey Langille, a former member of the band. 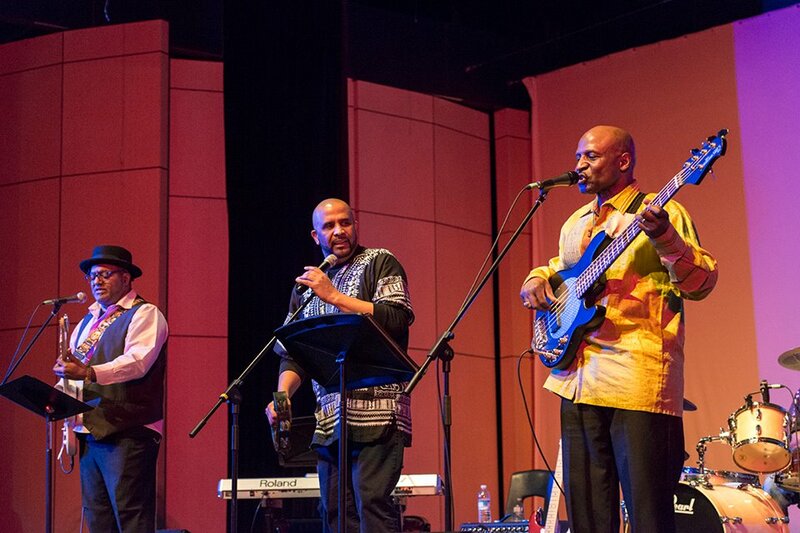 The band is a part of the African Nova Scotian Music Association (ANSMA) and in previous years has been nominated for an ANSMA award. Shoulder to Shoulder will be performing at our Oasis Cafe on Friday, August 23, 8:45-10pm.